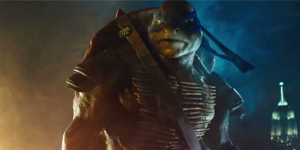 Here is our first look at the new reboot of Teenage Mutant Ninja Turtles. Being a kid born and raised in the ’80s, TMNT holds a dear place in my heart, but I’m wondering if this movie is destined for box office glory or box office bomb. Directed by Jonathan Liebesman and produced by Michael Bay, the trailer definitely sets the stage for an action packed film, and we come to learn that Shredder (played by William Fichtner) and April O’Neil’s father were responsible for the creation of the Ninja Turtles (a new twist to the origin story). After watching the trailer, though, I’ve come to the same conclusion as several others, which is that while the movie itself looks promising the turtles still sound like the ones from the cartoon. If you are going to try and create an action film with Ninja Turtles and have a realistic feel to it you should make sure the characters’ voices fit that world. It’ll be interesting to see how they sound in the next trailer, but for right now, I’m on the fence. Teenage Mutant Ninja Turtles opens August 8, 2014. Official Synopsis: The city needs heroes. Darkness has settled over New York City as Shredder and his evil Foot Clan have an iron grip on everything from the police to the politicians. The future is grim until four unlikely outcast brothers rise from the sewers and discover their destiny as Teenage Mutant Ninja Turtles. The Turtles must work with fearless reporter April and her wise-cracking cameraman Vern Fenwick to save the city and unravel Shredder’s diabolical plan. Who is your favorite Ninja Turtle?